Hello, admin and moderators, I asked for permission to open a thread about the contest ForexCup by FXOpen. FXOpen, one of the largest FOREX market broker companies, invites everybody to engage in the exciting world of trader's competitions! Forex trading, as most businesses, involves substantial risks. And inexperienced traders should not delude themselves into thinking that they can succeed from the start. It takes time and effort to hone your skills and master trading strategies to perfection, before you can make substantial profits. Using FXOpen demo accounts is a great opportunity to try your hand in Forex with an environment that faithfully reproduces live Forex trading conditions and carries no risk of losing real money. All company's efforts are aimed at providing its clients with the cutting-edge technologies for convenient and professional trading. Forex Cup, FXOpen's proprietary developed application, allows FXOpen clients to participate in forex competitions. Forex demo competition is a fun and exciting way to objectively assess your trading skills by competing against other traders. You will also learn to cooperate and share ideas in a team of like-minded traders. By using ForexCup you can trade with virtual money and still experience the whole complexity of a live Forex trading environment. Success in forex trading competition will also earn you some real money bonuses. This is a great way for ambitious newbie traders, who lack initial funds to get started with their live accounts. You can open FXOpen e-wallet account here. Please, check your rate according to the rules of the contest before the publishing. Pay your special attention to the rule “spreads between participants’ beds should be no less than 5 points”. Two contests have been already held at ForexCup during 2 months of 2013. As a result, 59 best participants received prizes and bonuses totally amounted to more than $6000. 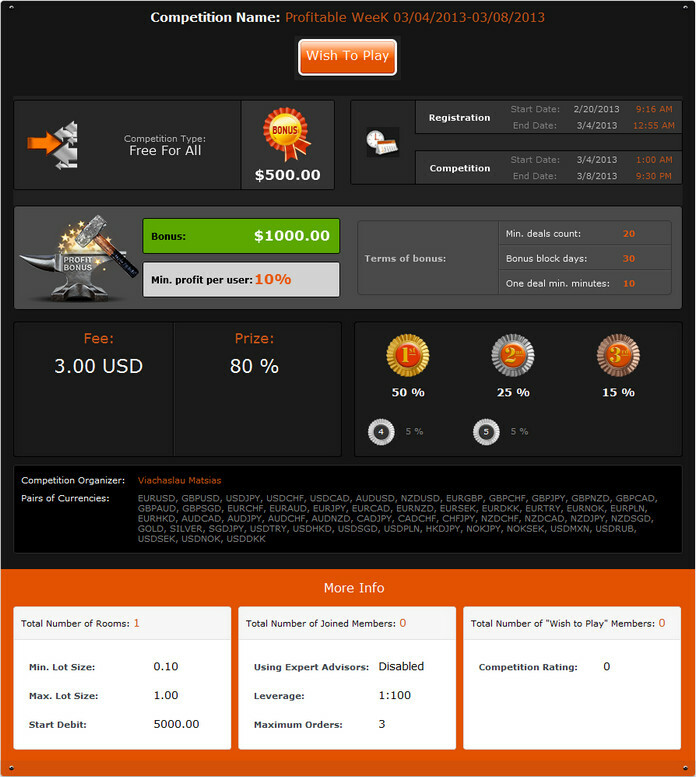 For example, 103 traders participated in the past weekly contest and 30 best participants got real cash bonuses. The winner received $371. According to statistics, the level of competition in ForexCup contests is not really high – usually, every third participant receives a cash prize! The forthcoming contest will not be an exception. The time has been already set and the competition will be held since March, 4 till March, 8. An entry fee is just $3. The terms of the contest are standard. On the 1st day of the competition each participant receives a virtual deposit - $5000 with a leverage of 1:100. After the start of the contest (at 1.00, Monday, in accordance with FXOpen terminal time) you have to trade at the Forex market using all available instruments. The main task is to get the biggest profit by the end of the contest. While participating, you will trade on ECN demo account, which provides an additional opportunity to appreciate all the advantages of that FXOpen service. The participant with the biggest profit by the end of the contest will become a winner. The more traders participate, the bigger the prizes will be, because entry fees are included into the prize fund. It is necessary to mention that there are 5 prizes for the most successful traders. Everyone, who increases a start-up deposit by 10% or more, will receive a cash bonus. 5th place - $25 + 5% from the sum of entry-fees + bonus. As a result of the contest, all participants, who increase a start-up capital by 10% or more, will get 1% from the received profit. March, 11 – results will be summed up. Participation in the contest is paid (an entry fee is $3). Remember that in order to participate it is necessary to have at least $3 on your e-Wallet (the sum of an entry fee). You can deposit necessary sum to your account via any payment system. If you have some funds in your FXOpen trading account, you can move the necessary sum to your e-Wallet. Go to your account. 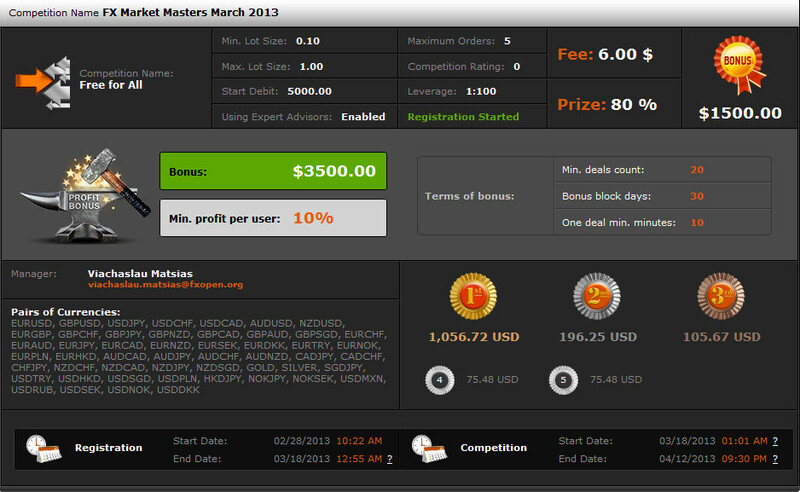 A new contest FX Market Masters March 2013 will be held since March, 18 till April, 12. The prize fund of the tournament amounts to $5000. A winner will become a Manager of a PAMM ECN account with the balance of more than $1000! The winner of the comparable contest, FX Market Masters February, received the PAMM ECN account with the balance of $1651. Together with bonus, his prize capital totally amounts to $1901! Therewith, 29 best participants of the competition received prizes for a total of almost $5000 (read more). We would like to bring to your mind that all smash participants, who increase a provided start-up capital by 10% or more, will receive a cash bonus which amounts to 1% of their profit. Participation in the competition is paid; the entry fee is $6. The prize fund of the contest consists of all entry fees and the sponsorship from FXOpen. 5th place - 75$ + 5% from the sum of entry-fees + bonus. As a result of the contest, all participants, who increase a start-up capital by 10% or more, will get 1%* from the received profit. April, 17 – results will be summed up. Hello all traders, Profitable WeeK March, 4 - March, 8 has started today. Let's grow your trading contest account. Please, check your rate according to the rules of the contest before the publishing. Pay your special attention to the rule spreads between participants’ beds should be no less than 5 points. ForexCup contests provide traders with the great chance not only to test their own trading strategy, but also to earn cash prizes and bonuses to a real account! One of the main purposes of such competitions is to bring out successful traders and recommend them to posts of managers of large-scale accounts registered with FXOpen. Thereby, we invite ambitious Forex players to participate in the next qualifying tournament, which will be held since March, 25 to March, 29. The winner of the contest will receive a prize ($200) and a cash bonus. Participation is free and everyone is able to receive a bonus – all you have to do is just to increase a start-up capital by 50% or more. - Trading is held on demo ECN accounts. • April, 1 – results will be summed up. FXOpen announces a new contest for the best trader of FXOpen forum. The event starts on April 1 and will last for 4 trading weeks! The prize fund makes up to $1200, while the most successful participants will receive real cash bonuses totaling $800! The contest invites all registered forum users, who have opened a demo account and made at least 30 posts. According to the rules of the competition, each participant must leave his posts in the thread "Spring 2013 Best Trader." He is required to describe every trade he makes in the competition account, at the opening of which he receives the initial deposit of $5000. If this term is violated, the participant will be disqualified and deprived of his prize. All the participants are encouraged not only to indicate the parameters of their trades (like currency pair, lot size, Buy/Sell and so on), but to reason their trading behavior, make some forecasts and share plans for their future trading activity. It would be perfect if you support your description with screen shots or similar schemes so that other traders could understand you better. The total amount of bonuses equals $800! The participant with the highest balance in the account by the end of the contest will become the winner. It should be noted that all trades must be described within 36 hours after their opening. The maximum number of the trades described must not exceed 5 trades per post. Please, see the details about the contest rules on FXOpen forum. Registration for the contest has already started! Each trader must apply for registration in this forum thread. After being moderated, he gets the password, registers in the contest and publishes the account number in the relative forum thread. The contest will last until April 26. Don’t miss your chance - prove that you are the best! Join the contest right now! 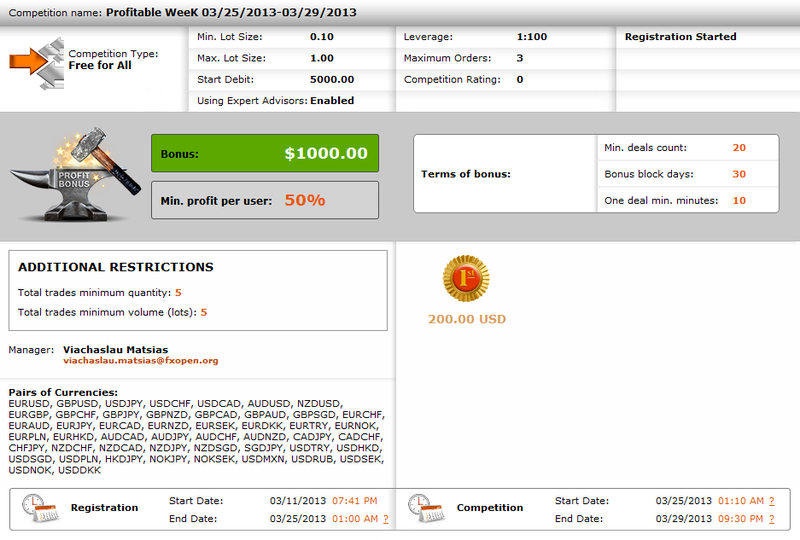 The contest Profitable WeeK 03/25/2013-03/28/2013 has been started today, let's grow your profit.